The Celebrate Recovery Participant's Guides are essential tools for the personal recovery journey. In the seven lessons in Guide 4: Growing in Christ While Helping Others, you will work through the final two principles on the road to recovery. More than just maintenance, these principles will help you prevent relapse and give you the necessary tools to help others in their recovery process. 8 Reserve a daily time with God for self-examination. Bible reading and prayer in order to know God and his will for my life and to gain the power to follow his will. 9 Yield myself to God to be used to bring this Good News to others, both by my example and by my words. "Happy are those who are persecuted because they do what God requires" (Matthew 5:10). By working through the lessons and exercises found in each of the four Participant's Guides you will begin to experience the true peace and serenity you have been seeking, restore and develop stronger relationships with others and with God, and find freedom from life's hurts, hang-ups, and habits. 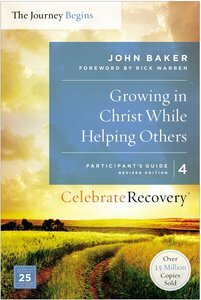 About "Crpg #04: Growing in Christ While Helping Others (#04 in Celebrate Recovery Participants Guide Series)"